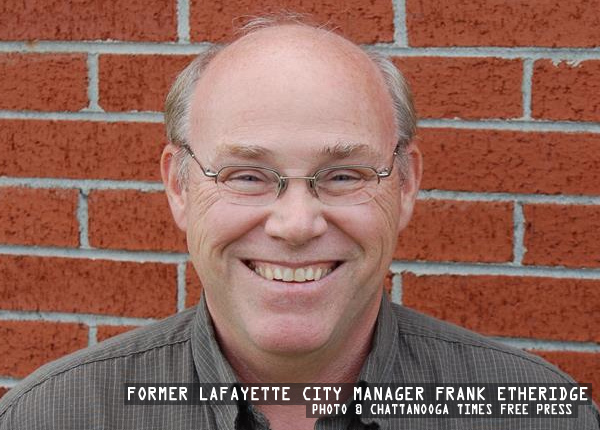 Per multiple city sources, LaFayette City Manager Frank Etheridge will be leaving his position as-of Friday. The change was announced to city department heads during a meeting this morning, and Etheridge apparently made the same announcement during a Rotary Club event this afternoon. No word yet what the specific reason was for his departure, and it’s still not clear if he quit, was fired, or forced to resign. Etheridge was hired in October 2011 to replace fired City Manager Johnnie Arnold. The decision to hire Etheridge was made by a lame-duck four-member city council, two members of which had already decided to retire. At the time LU pushed to have the decision made by a newly elected council, so new city leaders could have their own man (or woman) in the job but the outgoing councilors chose Etheridge to make their own mark on the future. Etheridge lists five non-military jobs on his résumé, beginning in 1997 when he was a Planner, Surveyor, and Project Manager for a Florida-based engineering company. He held that job for a year and two months, then moved on to work as Planning and Development Director for Camden County, Georgia. That position lasted exactly three years, followed by a two-year, two-month stint as Building and Planning Director for Habersham County and a three-year, nine-month job doing the same thing in Jackson County. His last job was City Administrator for Pembroke, GA (population under 3,000), another position that lasted only 23 months. That’s the kind of job hopping you expect from a single twenty-something trying to find their place in the world, not a professional married adult with children in college. What grown man, over forty years old, works five jobs in fourteen years? Perhaps a grown man who gets fired frequently. Inquiries as to the reasons for those dismissals (which didn’t inherently make Etheridge a bad guy) were never provided. At this point he should probably consider another line of work. Etheridge’s wife Denise is currently an assistant editor of the Catoosa County News/Walker County Messenger. No word on her position. Updates as this story develops. I hope he doesn’t try for the opening in Fort O …..
i understand Mr Etridge has bouught the city of LaFa yette from a 680,000 defict in the red to being in the black.Sounds like he was doing something right. The people in the city deserve to know the truth as to why he is leaving.Could it be that he was trying to set some things straight and the connection between some dept heads & councilmen was about to be exposed. It would be more useful to the community if LaFayette had an objective alternative source of news. With no intent of comparing Frank Etheridge with Jesus, I think it is ironic that his job was terminated on Good Friday and you were verbally crucifying him just as the crowds did at the crucifixion of Jesus. Your lack of objectivity is highlighted by your catchy headline of Five-Fired-Frank and your statement in your opening paragraph which stated, in essence, that you did not know at the time if he had been fired or not. You highlight the fact that Mr. Etheridge has been fired from a number of jobs but don’t place much emphasis on the fact that Lafayette has fired two city managers in 18 months! Perhaps you need to do an expose on the dysfunction of city council. Finally, your lack of objectivity and professionalism were glaringly evident when you felt the need to bring Mr. Eldridge’s family into your story. I am not in a position to know if Mr. Etheridge did a good job while employed by the city of Lafayette, but kicking someone while they are down is not part of my way of relating to fellow human beings. Of course, seeing how his (Ethridge) wife works for the local paper, I’m sure anything coming from there would be fair and balanced. 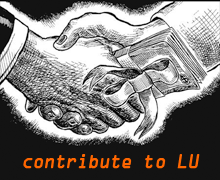 LU is a blog, and amazingly right most of the time. It usually takes the “legitimate media” a while to report what we read here first. Before you verbally crucify LU, you should read the breaking news stories in the archives here and see how they eventually get reported after the fact. Sometimes it’s like pulling teeth to get the truth out of LaFayette & Walker officials. Your comparison of Frank Ethridge with Jesus is ludicrous and turns my stomach at the thought. I think everyone should look at http://www.aryankindred.com so very interesting facts and articles on their books page as well as People in Lafayette now know Aryan kindred are not some bunch of hicks nor hitler following un educated people. Our church membership is over 1000 verified members nationwide and thats the new members that doesn’t include the 250 that founded our organization so who knows maybe A.K will push and get behind a mayor that would really benefit the people of Lafayette. Our web page is only half finished so look for much more informational facts as well as statistics and live you tube sermons every week so the people on the outside looking in better learn about what we stand for and who we are. We welcome you to stop by our page and email us with any questions about our beliefs and organization especially the church division of our group. To Corley nease I would agree with your statements we live in a very small town that doesn’t take a rocket scientist to run yet we have more gossip and mud slinging than most towns three times our size! People seem to want to hide behind these computer screens and either make assumptions they know very little about or exaggerate already existing situations. As i said this is a small town and as so people should get along in my opinion we should focus more on drug rehabs as well as drug prevention programs intended to keep users out of jail and give hem the help they need to quit instead of these small town judges with such big heads throwing out ridiculous sentences which only makes the offenders life worse in the end when they spend years in a 6×9 prison cell and then get released with nothing but a parole or probation officer screaming “Get a job” when in reality nobody wants to hire ex offenders. But from my point of view people in this town love to kick a person while they are down and you may ask why is the reason for that?? Because the people of this town for the most part would never have the courage or conviction to state their beliefs and opinions while a person is on top and doing well but yet only have the nerve to hide behind computer screens and mis quote bits and pieces that they have googled and read for five to ten minutes then they believe they are experts. We live in Lafayette Georgia people a small town where people should be helping one another instead of trying to ruin reputations and to all of you so called Christians step outside of your church and do something besides washing cars to raise money for trips and things that really have nothing to do with helping our community. Start greeting your fellow man when you see each other out in public, start helping the troubled youth as well as troubled adults so that we don’t see tragedies in our small town. An ounce of prevention is worth a pound of cure really rings out right now. I agree, we should help all our brothers and sisters … black ones included, as God created us all.